Happy Friday, everyone! 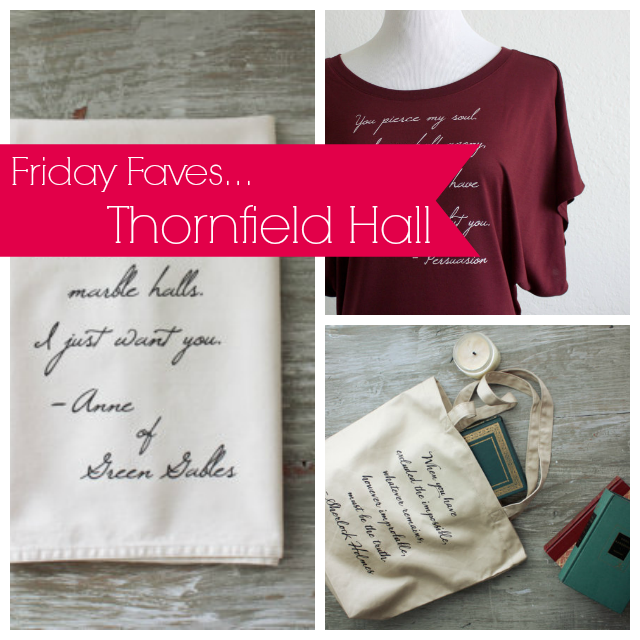 I’m here with another of my favorite bookish Etsy shops this week: Thornfield Hall. Based of Colorado, this shop was started by Katie in 2013 and soon became a raging success. She features screen-printed scarves, shirts, tote bags and tea towels, all sporting quotes from classic novels. The products at Thornfield Hall are all top quality: created by hand from beautiful materials like soft hand inks and cotton jersey. I adore the muted color palette of her clothing options and the softness of dolman sleeves and chunky scarves!